5.1 Wrong font when exporting statistics. What to do? 6.1 5 point choice question type - what do the values located under the "Sum" column represent? The LimeSurvey statistics can be visualized in either the expert mode or simple mode. By default, the expert mode is loaded when you click on the Statistics button. Let's say you've got a survey running, or it is finished and you want to start analyzing the results. LimeSurvey can dump all the results into an Excel spreadsheet or CSV file. You can do whatever you want with the data from the respective file. Alternatively, you can use the statistics feature to have a look at your data and start getting some useful information from it. The statistics - expert mode feature allows you to 'filter' your data and retrieve numbers and summaries of different fields from it. The statistics script doesn't attempt to do highly complex filtering, but you'd be surprised at the sort of information that can be easily obtained. As it can be observed below, there is a checkbox for each question that can be selected in order to show a response summary for each question, and an icon that when clicked (or if the mouse hovers over it), it gives you the full text of the question. To view the results for a question or questions, check the checkbox(es) at the top of the question(s) and then click "View statistics". You will then be given a "Results" table which will indicate the number of cases and a "Field Summary" table for each question selected which summarizes all possible answers in the question(s), their totals, and their corresponding percentage. Please note that the statistics are displayed on the same page because the default output format is HTML. If this is changed to PDF or Excel, then a pop-up will appear once the "View statistics" button is pressed, asking you to save the respective file on your machine. Two types of filters exist: general and response filters. All records: the aggregated number of complete and incomplete responses. 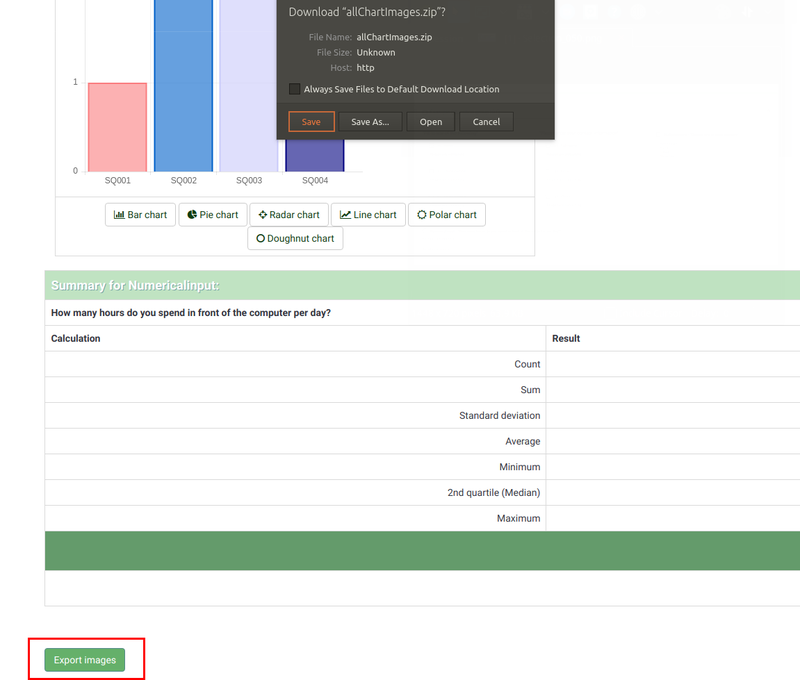 Statistics report language: if additional languages are used, this filter option is useful to divide respondents based on the language they used to fill out your survey. For a discussion on incomplete responses, see the response summary wiki section. Subtotals based on displayed questions: it is deactivated by default. 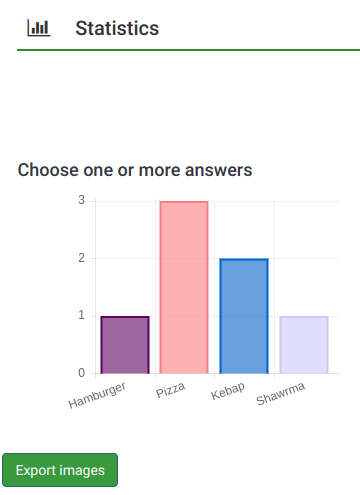 It counts stats for each question based only on the total number of responses for which the question was displayed (good way to filter the unfinished/incomplete responses). Submission date: displayed only if timings is enabled. 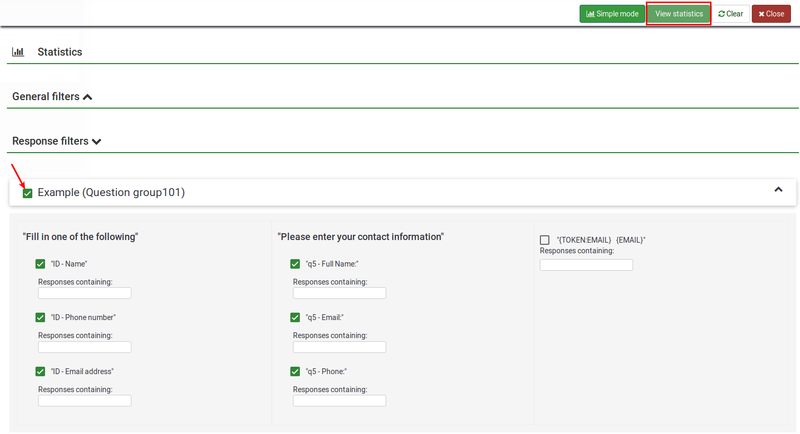 You can filter the data based on the submission date of your collected responses. To get the answers filtered according only to the general filters, enable the "View summary of all available field" option and click on the View statistics button located in the upper-right part of the screen. By response: click on one or more responses in the list under each question to filter the data by those responses (use CTRL/click to select multiple responses in the same question). Note that if you choose to view the summary of all available fields (checkbox at top) you will need to select your response filters before checking that box. By text: you can search the responses to a free text question type (and similar types) by entering a text. If you want to search for a partial string you can use the percentage sign (%) as wildcard. E.g. : If you look for 'Tom%', it will find entries with 'Tomb' and 'Tommy', etc. By numerical value: you can search the responses that contain a certain numerical value if number-based question types are used. 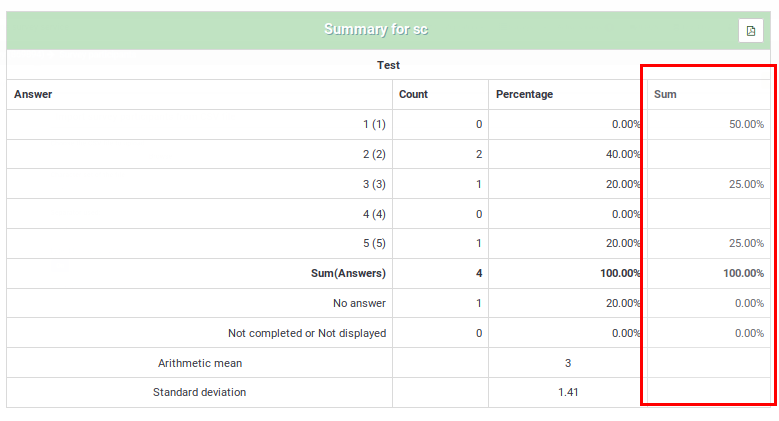 Selecting "View statistics" will then give you the "Results" table, indicating the number of responses matching your criteria, and a "Field Summary" table for each question selected which summarizes all possible answers in the question(s), their totals and their percentage. It is important to note that these results are a subset of your total responses. So, for example, if your criteria display 146 records out of a total 180, the summary will show the breakdown of just those 146 records for that table. The images below indicate that I have elected to view the stats for "Employment status" of completed records/female/age 18-25. This gives me the results for 6 out of 13 records. If you set criteria on the same question that you ask for a summary, then that question will only present answers matching your criteria. So it is good practice not to set any criteria on the same question you are getting a summary of. To select multiple entries for a question hold down the CTRL button when clicking. To "unselect" the last criteria (if you want to clear all criteria from a question) click on the respective highlighted answer while holding pressed the CTRL button. For technical reasons the Excel output does not contain any charts. If the PDF output is selected, charts are limited to pie charts (single choice questions) and bar charts (multiple choice question types). For charting, the library pChart is used, which is completely included and usually doesn't have to be configured. After the graphs have been generated you can export them easily. Right click on a graph and choose "Save image as", then save the graph as a .png file to your chosen location. To see which questions can make use of statistics and/or graphs, you have to read each question type manual entry from here. If tab statistics is available, check which options are displayed under this tab. Three statistics attributes exist: chart type, display chart, and public statistics. incomplete responses: all responses that started to be filled out by respondents, but weren't completed. A response started when the participant clicked the "Next" button in the survey, but did not click the "Submit" button in the end (did not land on the end page of your survey). Technically speaking, this is when there is no SubmitDate in the response table for this entry, but new data set was created already. no answer: when the question was displayed, but the participant hasn't given an answer. Technically speaking, this is when the question is not mandatory, was displayed, received no answer and the user clicked "Next" or "Submit". The consequence is that the database field for this answer is set to "" (empty string). This "no answer" status cannot be really computed for "Date" or pure "Numerical questions" where the database field cannot record a string. not completed/not displayed: when the page containing the question was not displayed. This can be because of conditions, or just because the participant left the survey before this page was displayed (or just while this page is displayed, but without clicking the Next button). Technically speaking, the database field for this question is filled with a NULL value. Excel: To further work with your (filtered) data, choose Excel. You can export the file from a spreadsheet application to CSV to work with more advanced statistical tools such as SPSS or R.
Number of columns: two is the default number. If you wish to have statistics and graphs displayed on only one or three columns, choose the desired value from this option. It applies to HTML statistics. Graph labels: choose how the label should look like in the graph. As defined in question settings: useful if you wish the graph not to be displayed. If this is the case, deactivate it from the question settings and select from the "Statistics" panel this option. As you can observe, fewer graphs are displayed than in the expert mode. 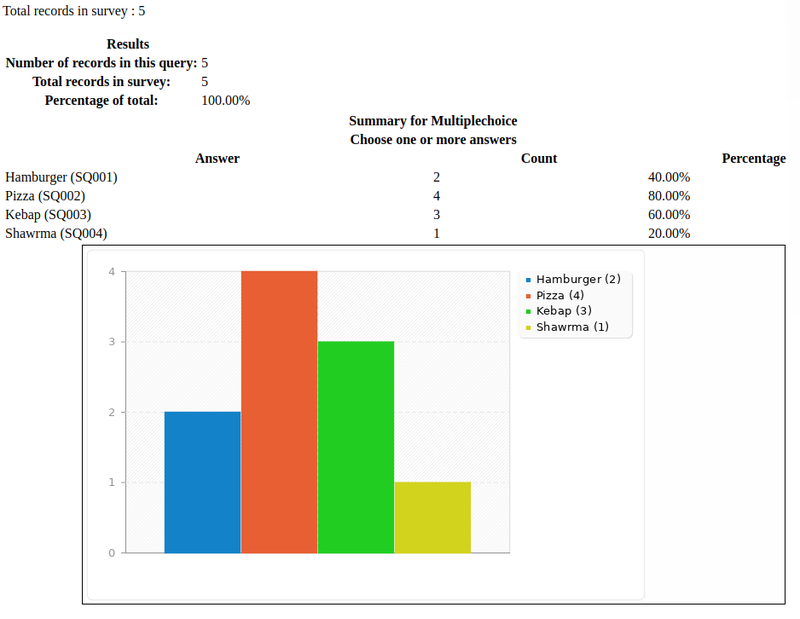 While in the export mode you can display graphs with respect to those who filled out the survey, did not answer it or did not finish completing it, the simple mode displays only statistics that rely on the "countable" data submitted by the respondents (e.g., single or multiple choice questions as well as array questions). There is only one option to filter the data within the simple mode - via the responses to be included in the statistics. As a result, the statistics may include the complete responses, incomplete responses, or all responses (the aggregated sum of the first two options). This option is located in the upper-right part of the panel. 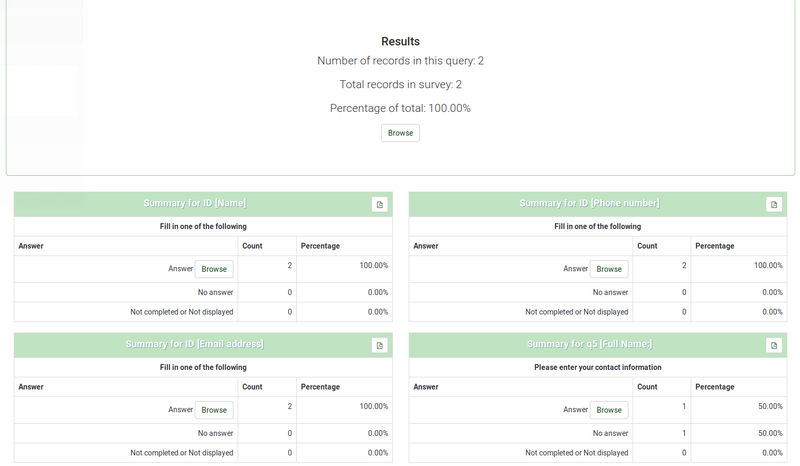 If you wish to have direct access to the simple mode of Statistics, LimeSurvey allows you to create your own entries in the menu. For more information, check the menu entries configuration wiki section. 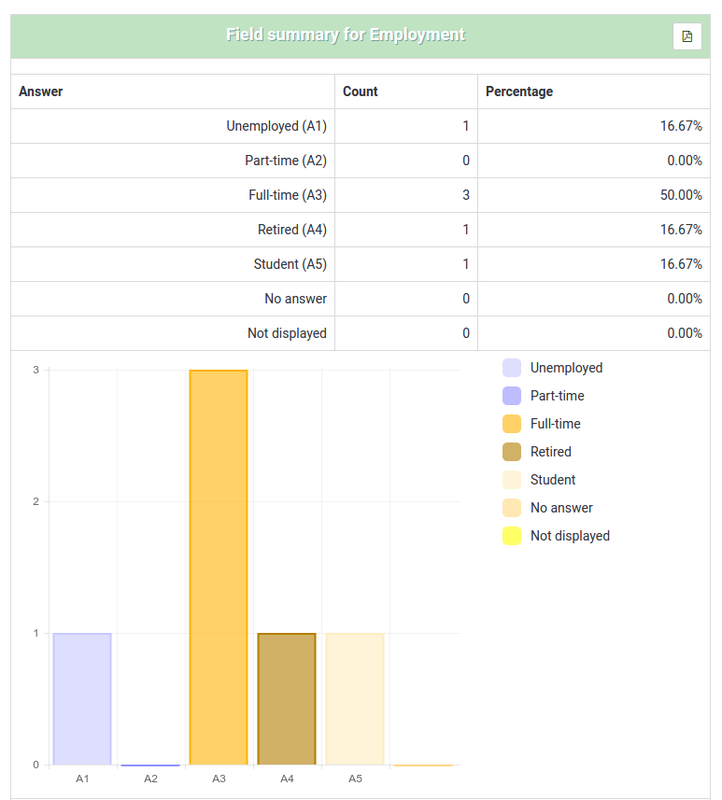 LimeSurvey includes the functionality to display simple statistics to the general public or to your participants after they have ended filling out an online survey. 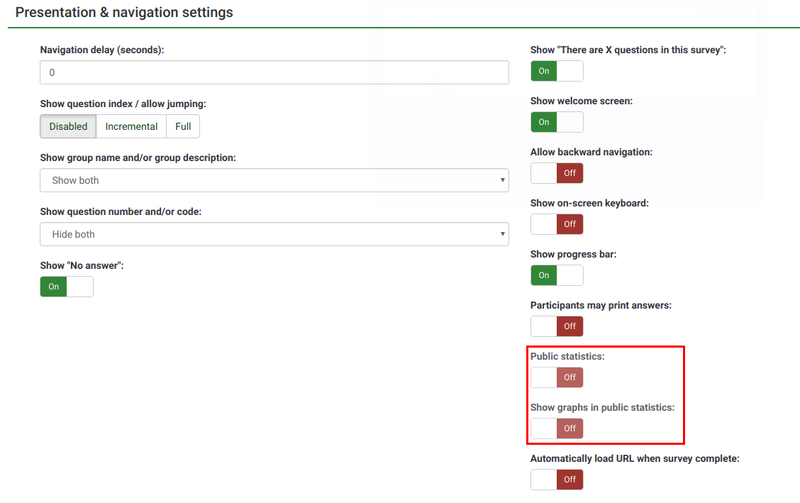 Two components need to be enabled in order to activate and display statistics to your participants. The first one refers to the public statistics of your survey which must be enabled (it is turned off by default). It is located under the Presentation tab. To also show graphs, look on the same page for the Show graphs in public statistics attribute and enable it (it is disabled by default). Once you have set your survey to display statistics, you need to indicate question-by-question which statistics you want to be displayed to your respondents. By default, no questions will be displayed. To have them displayed, access the desired question, look for the "Statistics" tab and enable the Show in public statistics attribute. Please note that only bar charts can be displayed in public statistics. The looks of the public statistics page can be modified via template.css (search for "#statsContainer"). However, there is currently no template of it's own that can be edited in the LimeSurvey theme editor. Feel free to edit the following wiki sections to let other LimeSurvey users learn about statistics-related hints & tips. Wrong font when exporting statistics. What to do? For some languages (like Chinese), the usual font used (Vera) does not cover the needed character set. In that case you can use the setting $chartfontfile to set a new TTF font file in config.php (Check out config-defaults.php for the right setting). For Chinese (Simplified and Traditional), another font has to be used such as the FireFlySung font which can be downloaded from github. 5 point choice question type - what do the values located under the "Sum" column represent? Y percent of the respondents DISLIKE item ABC, where Y represents the percentage of those who answered "1" and "2"
X percent of the respondents LIKE item ABC, where X represents the percentage of those who answered "4" and "5"
Z percent of the respondents have a NEUTRAL opinion about item ABC, where Z represents the percentage of those who answered "3"
This page was last edited on 19 March 2019, at 22:02.